Like many finite element codes, magnum.fe solves problems on arbitrary tetrahedral meshes. Depending on the complexity of the geometry, the creation of suitable meshes can be quite challenging. magnum.fe comes with built-in meshing capabilities for simple geometries. For complex geometries it is recommended to use specialized external meshing tools. Meshes generated this way can be converted to magnum.fe compatible files with the conversion tool magnum.msh. More complex geometries can be generated with the library mshr that is part of the FEniCS distribution that comes with magnum.fe. With mshr the geometry can be defined by combining simple geometric shapes, e.g. More examples can be found in the demo directory of mshr. Micromagnetic problems often involve different materials. For instance a magnetic sample might be composed of layers with different magnetic material parameters. That means that magnum.fe has to be aware of different regions within the mesh. These regions can be either volumes (cell domains) or areas (facet domains). FEniCS and hence also magnum.fe offers two possibilties to attach domain information to meshes. The first one is to store the information in the mesh as a MeshDomains object. The other possibilty is to keep the domain information apart from the mesh in so-called MeshFunction objects. For details please refer to the FEniCS manual that is available under http://fenicsproject.org/documentation/. However, if you use external meshing programs and convert the meshes the domain information is automatically generated and you will not have to deal with the details of MeshDomains and MeshFunction classes. This command reads a mesh from sample.msh and generates a shell with 3 layers and \(4 \times 4 \times 4\) cells that has a margin of 1.0 to the original mesh. The resulting mesh is shown in Fig. 5. A very powerful open source mesh generation tool is Gmsh. In this section the generation of a simple circular multilayer stack with Gmsh is described in detail. The geometry in Gmsh is usually defined dimension by dimension. That means that points are connected to lines, lines are connected to surfaces and surfaces are connected to volumes. In order to create the geometry, create an empty ASCII file called stack.geo and open it in the editor of your choice. We start by defining a meshing constant cl that gives a measure for the edge length of the tetrahedra. Next we define a couple of points that we need to describe the circular base area of the stack. Note that every point has a unique ID (Point(ID)) and besides the three spatial coordinates it is assigned the discretization constant cl. In the next step the points are used to define the segments of the circular base area. The ellipse command requires four arguments, namely the start point of the arc, the center of the arc, an arbitrary point on the major axis of the ellipse, and the end point of the arc. The segments are now connect to a line loop and the line loop is used to define a surface. Now that all volumes and surfaces are defined they have to be declared as physical volumes and surfaces in order to make them addressable in magnum.fe. The numerical IDs defined by Physical Volume(ID) and Physical Surface(ID) are available in magnum.fe later on. Save the file and create the mesh from the geo file by calling gmsh -3 stack.geo on the command line. This should create a stack.msh file. Note, that Gmsh sometimes fails to create the mesh especially when it comes to regular extrusion. In this case repeated calls to Gmsh usually fix the problem. In order to use this mesh within magnum.fe you can convert it by calling magnum.msh stack.msh stack.xml. Fig. 6 shows the resulting mesh with its cell domains and facet domains. For a complete reference to Gmsh please refer to the Gmsh manual that is available under http://geuz.org/gmsh/doc/texinfo/gmsh.html. In contrast to Gmsh, Salome is a general pre- and postprocessing tool that has a comprehensive graphical user interface for the generation of geometries. Salome supports a number of backends for the actual mesh generation including Netgen and Tetgen. 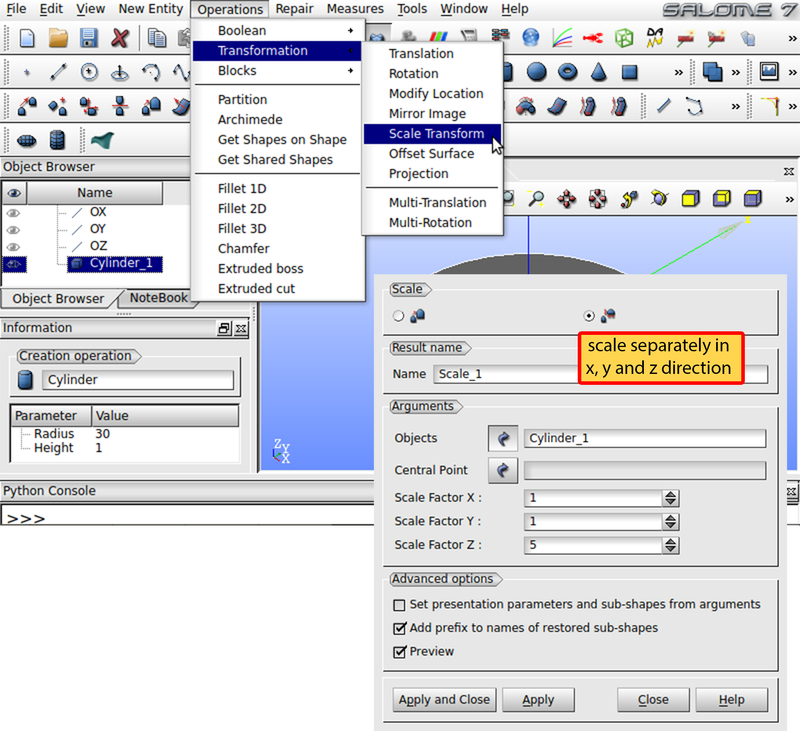 Salome has different user interfaces for building geometries and meshing. 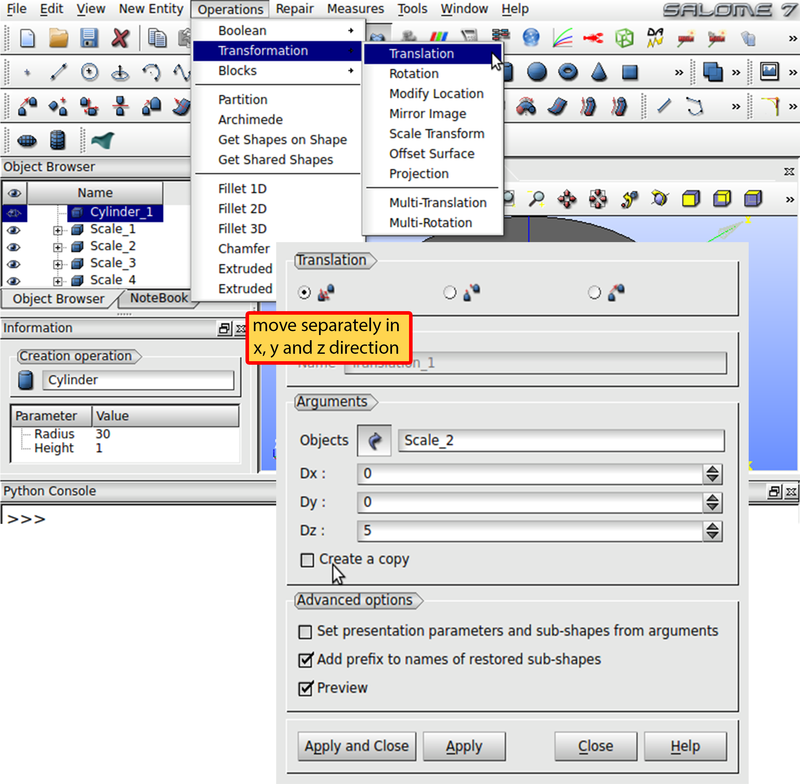 In order to build the multilayer structure presented in the preceding section with Salome, select Geomtry from the drop-down menu from the main program window as shown in Fig. 7 and open a New project. Fig. 7 Salome main program window. 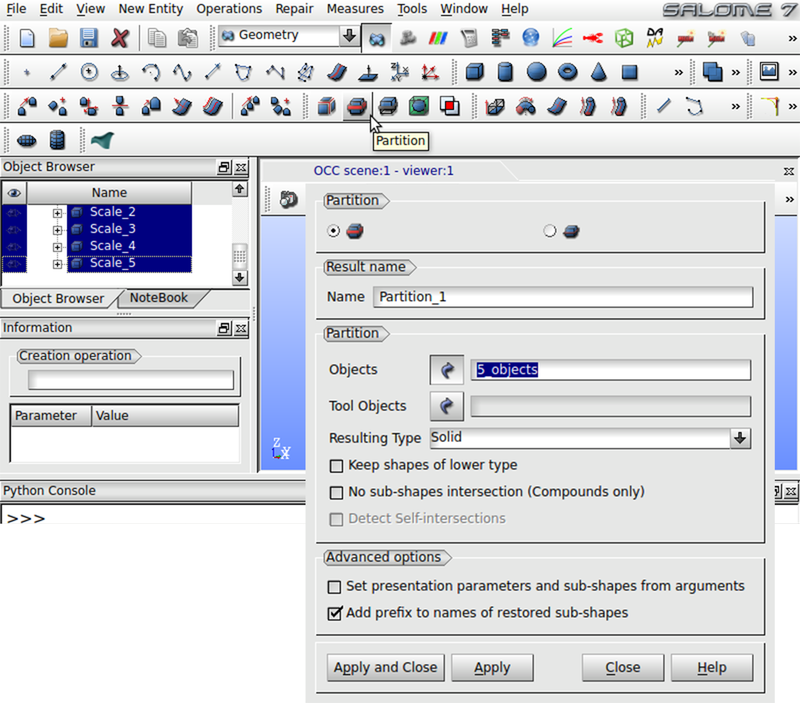 Select Geometry from dropdown menu in order to create your model. Next we create a cylinder with a height of 1 that will serve a template for the stack layers. 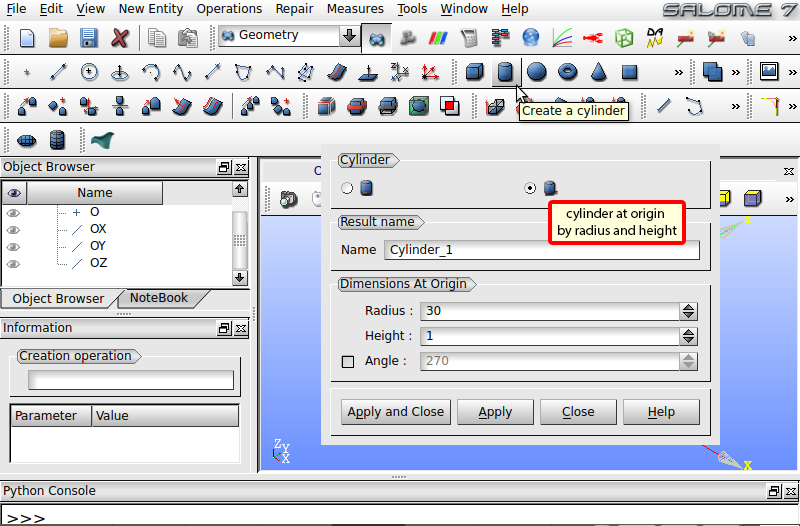 Click Create a cylinder in the toolbox as illustrated in Fig. 8. Select the right radio button in the register Cylinder and enter a Radius of 30 and a Height of 1 in the register Dimensions At Origin. Press Apply and Close to apply the scaling. Fig. 8 Create generic cylinder with height 1 as template for the different layers of the stack. In the next step the template cylinder is used to create the induvidual layers with different thicknesses. Select Operations -> Transformation -> Scale Transform in the menu bar as shown in the Fig. 9. Select the right radio button in the register Scale. Under Objects choose the template cylinder as basis object of the transformation. Use a Scale Factor of 1 in the x and y direction and 5 in the z-direction. Press Apply to create the new cylinder. Consecutively change the Scale Factor Z to 10, 1.5, 3 and 5 and press Apply to construct layers with the desired thicknesses. Afterwards close the window. The Object Browser on the left now contains the basis and 5 scaled layers. Fig. 9 Copy and scale the template cylinder in order to create the individual layers. Next, we have to move the layers along the z-direction to construct the final model. Choose Operations -> Transformation -> Translation in the menu bar as shown in Fig. 10. Select the left radio button in the register Translation and choose layer Scale_2 with 10 height under Objects. Set Dx to 0, Dy to 0 and Dz to 5 for a shift of 5 in the z-direction. Uncheck Create a copy in order to merely transform the layer without duplicating it. Press Apply and shift layer Scale_3 by 15, Scale_4 by 16.5 and Scale_5 by 19.5 in the same way. Then close the window. Fig. 10 Move cylinders vertically to create the complete multilayer stack. So far the layers are not linked to each other. Hence, during the mesh process the borders between the layers would be treated separately and same surfaces would be discretized more than once. Click Partition in the toolbox as shown in Fig. 11, select the left radio button in the first register and choose the 5 scaled layers as Objects. Click Apply and Close to create the partition and then close the window. In order to generate IDs for different regions, we have to create groups. Fig. 11 Merge induvidual layers in order to generate a solid model of the multilayer stack that is aware of its layer structure when meshed. 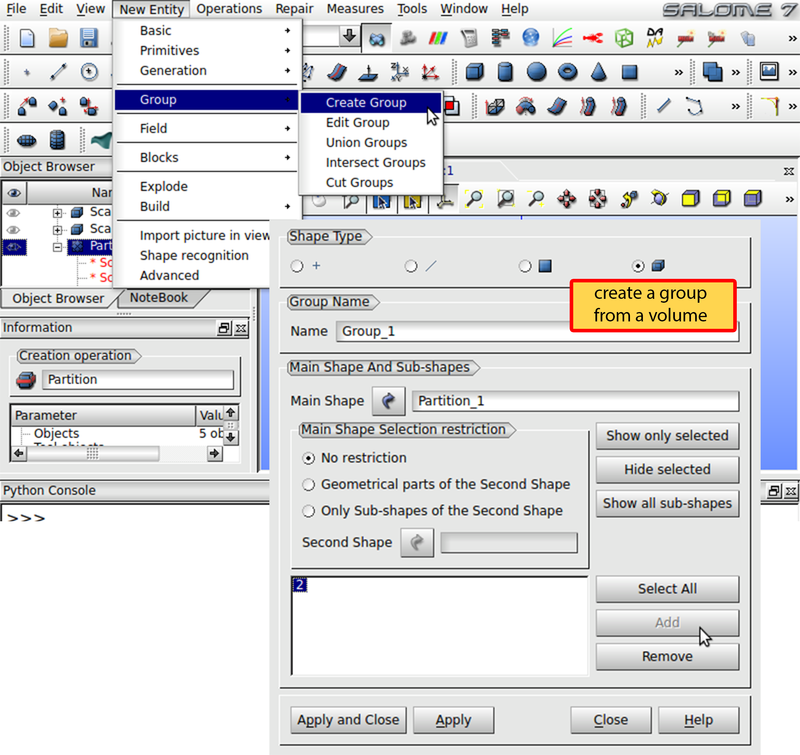 Select the Partition_1 in the Object Browser and click New Entry -> Group -> Create Group in the menu bar as illustrated in Fig. 12. Under Shape Type choose the right radio button to use volumes for the grouping. The Main Shape has to be Partition_1. Next, click at the bottom layer in the viewer and press Add. Note, that you have to hide the original cylinder objects in the object browser in order to ensure that the member objects of the partition are selectable in the viewer window. Click Apply to create the group. Repeat for every layer of the model. The partition should then have 5 groups. The geometry is now ready to get meshed. Fig. 12 Create a group for each layer to make the meshing module aware of the layers structure of the stack. 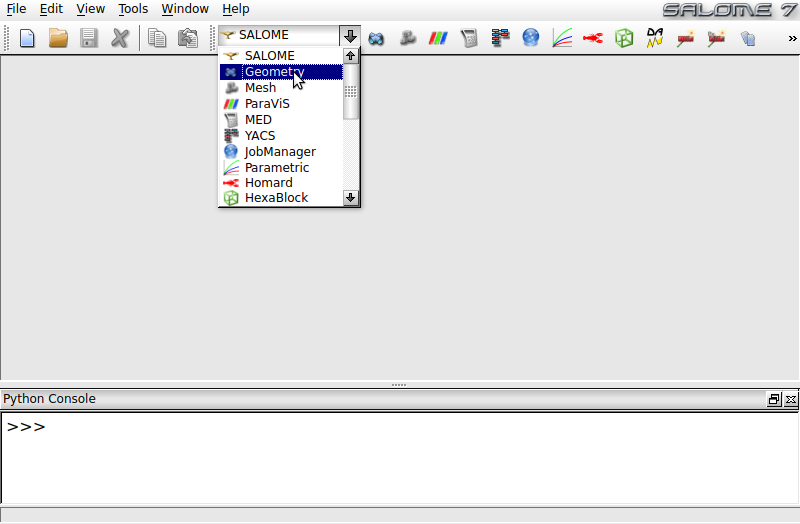 Change to the Mesh mode of Salome in the drop-down menu from the beginning. Click Mesh -> Create Mesh. Choose Partition_1 as Geometry. In the 3D register use Tetrahedron (Netgen) as Algorithm. Click Assign a set of hypotheses -> 3D: Automatic Tetrahedralization to determine a mesh length for the discretization. In the next window enter 5 under Length and close the window. Press Apply and Close to accept the mesh. 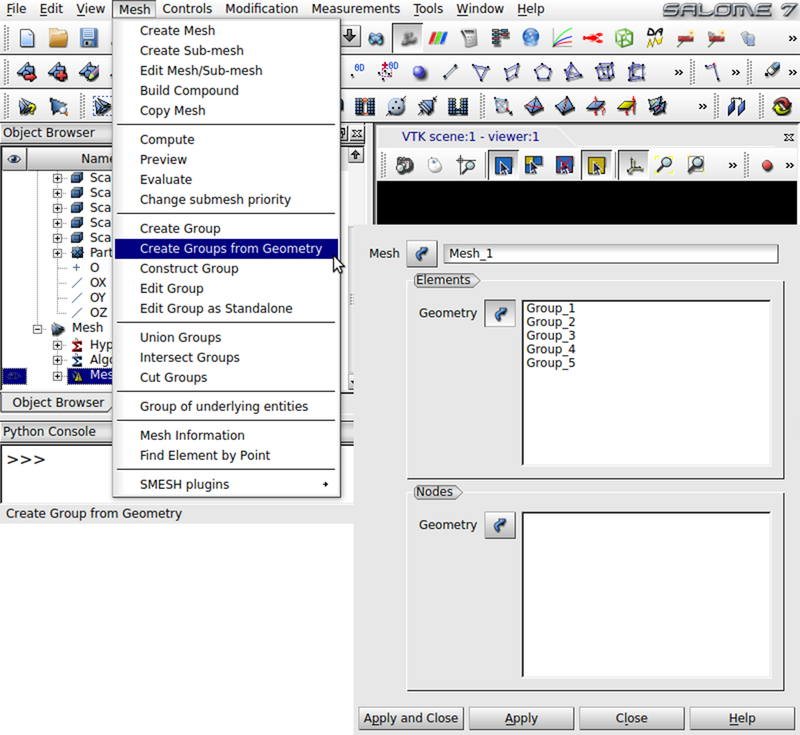 In order to mark the mesh cells with IDs according to the generated groups, select Mesh_1 in the Object Browser and click Mesh -> Create Groups from Geometry in the menu bar as illustrated Fig. 13. Insert the 5 groups of Partition_1 under the register Elements and click Apply and Close as shown in the figure. Now the mesh can be created. Right click Mesh_1 in the Object Browser and select Compute. This should give you a of your geometry. Fig. 13 Create mesh groups in order to mark the mesh cells of the individual layers with the layer ID. The resulting mesh is best save a med file which can be converted by magnum.msh. Right click Mesh_1 in the Object Browser and select Export -> MED file to save the mesh. Don’t forget to save your Salome project. The MED file can be converted to a XML file with magnum.msh as described in Section Converting meshes. Open source alternatives to Gmsh and Salome include Netgen and TetGen. Netgen and TetGen, like Gmsh, are pure meshing tools, that require the geometry definition as input file.